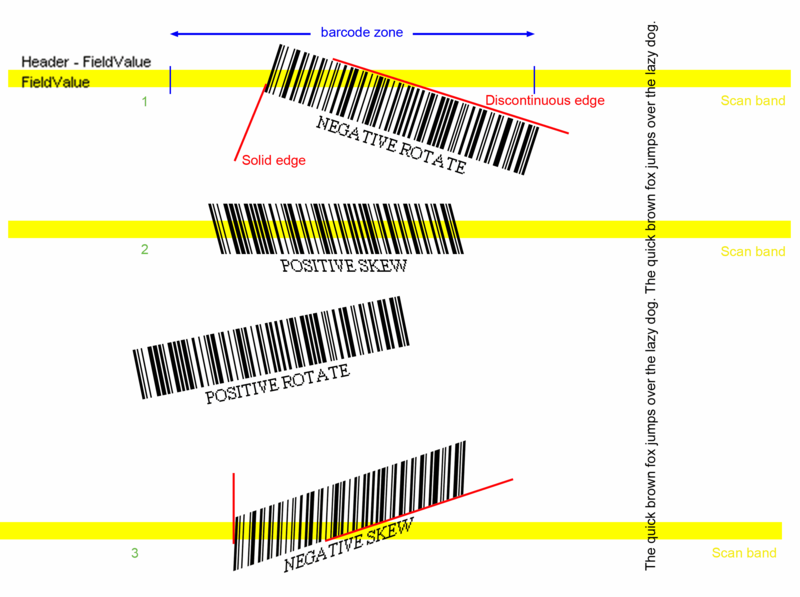 If barcodes will be surrounded by quiet zones, such that one can identify the beginning and end of any suspected barcode before one has to worry about trying to decode it, one can easily narrow down the possibilities for barcode type and compute bar/space widths without fancy histogram techniques. For example, if there are 5n+4 bars between quiet zones (for some value n), the code might be an I2of5 barcode containing 2n+1 wide bars and 3n+3 narrow ones, along with 2n wide spaces and 3n+3 narrow ones. If one expects a 2:1 wide/narrow ratio, one can figure that the narrow bar width should be the total width of the black areas, divided by (7n+5). Likewise the narrow space width should be the total space of the white areas (not counting quiet zones) divided by (7n+3). If the number of bars isn't 5n+4, the code isn't I2of5, so there's no need to parse any further. For Code39, the number of bars must be a multiple of five, and the bars should be processed in groups of five. There are two types of Code39 barcode (two wide and three narrow bars, plus one wide and three narrow spaces, or else five narrow bars, and three wide and one narrow spaces). If less than half the area within a symbol is white, it's the former style; if more than half, the latter. Once the style is determined, the wide/narrow widths for bars and spaces may be ascertained. This approach is nicely amenable to things like Code128 which have multiple bar/space widths. Because the 'ink density' of Code 128 isn't constant, it's necessary to compute the module width based upon total symbol width, without using total white width and total black width separately. This makes it harder to factor out the effects of printers that cause black areas to come out wider or narrower than they should, but is much easier than using histograms. For any computing problem there are any number of solutions and you are of course welcome to publish your own. If you can improve on mine, you are welcome too - that is what I did with qlipoth's work and he with Liedblad's original version before me. However, I have the feeling that you are trying to solve a problem that is already sufficiently solved (the published code already detects Code39, Code128 and EAN, also in bad quality scans), while not progressing in the problem that is still open: my code is not able to detect rotated barcodes very well, if at all. I tried a basic Hough transform and it works well only if the rectangle where the barcode is located is already known, so that the transform can be applied on an area without other image elements. My application however needs to detect multiple barcodes on pages that also have text and other graphics. Just applying a Hough transform over the full page often badly malfunctions. If you look at this image, you may also notice a problem with the bar counting that you propose: actually in a rotated barcode, the scan line will not cover the full barcode and thus not return a complete bar count. What I plan to do is find partial barcodes (with the same approach that I use now) and if I find one, use that information to identify the rotated rectangle containing the barcode fragment that was found. One more problem that you should be aware of: you cannot expect a 2:1 wide/narrow bar ratio. I have seen both 1.7 : 1 and 4:1 in Code 39. Also, in a bad scan the white bars are drawn too wide and the black bars too narrow (or the other way around), because the lighting is off. This causes a wide white bar to have a very different size from a wide black bar. This is the reason why the current version of the code does measurements for white and black bars separately. I had to later relax the constraints that I set on the ratio between white and black, to be able to pass more of our test material. Possible to integrate scew angle? it's possible to integrate an scew angle? This is possible to calculate scew angle on scanned bape by some simple alg's or this cab be calculated within scanning software. Mostly uses some sort of transformation like Hough Transformation. With .NET it's easy but very slow to deSkew the image by this know angle and it's takes a lot of ressources. Is it possible to incorporate an scewing angle as parameter in calculation routines? Maybe this angle manipulates internally calculated values in some easy/linear way or a procedures cas use their value for calculating internal values? Re: Possible to integrate scew angle? That is a possibility yes. If the scanning software can give the skewing angle, it would certainly help to pass that. I agree about transformation algorithms, they are not only fairly complex, but also likely to be agonizingly slow if implemented in c#. One thing that you need to consider also is that the rotation test that you did might give worse results than an actual scanner. Usually artificial barcode generators produce bitmaps where the most narrow bar is exactly 1 pixel, which quickly leads to aliasing defects of more than the bar width if you rotate - that is almost impossible to compensate for. An actual scanner will usually scan a barcode with the most narrow bar and gap being at least 4 - 6 pixels wide, and that is much easier to recognize than the artificial sample. actually it's possible to calculate skew angle by software really fast. Problem with barcodes is, that they developed to work under other conditions as digital document management - they must be printed at really high resolution printing engine and readed by barcode readers. This conditions are not given if the rendered pixelwiese and printed and scanned by paper scanners. What could be interesting, is to calculate scew angle and if this one is to big (>5°) use it by software, otherwiese not. I am happy with the solution, because it not only solved my problem, but also saving is now faster and the output files are more compact when GDI+ is used. You say "actually it's possible to calculate skew angle by software really fast". Probably true, but I did not find any open source examples of doing that, so I will have to "invent" my own solution. Anything I found was either not freely available or patented, so I can't use it. Please consider this image, that I use in the explanation of my proposed approach. The current algorithm is visualized in the yellow "scan bands" and the blue "barcode zone" boundaries. The software scans strokes of the image top-to-bottom (and left-to-right, not shown). For each stroke it looks for large blank spaces and subdivides the scan bands in "barcode zones" by cutting it up through the middle of each large blank space. - solid edge angle: this is shown in the leading edge of sample 1. When we travel down the scan band, the start of the black pixels for each scan line will gradually shift in one direction. From that we can fairly easily calculate a skew angle and deskew. - In a rotated barcode, there will also be a discontinuous edge. When we travel down the scan line, the furthest black pixel will regularly "jump back", where the band cuts through a gap in the barcode. We can still approximate an angle, by determining the average direction and minimum and maximum black pixel coordinate in the scan band. B. From the solid edge angle, the band can be deskewed by shifting the pixel start point before averaging vertically. This would be enough if skew was the only defect (e.g., second barcode in the image). For a rotated barcode, this will give us a partial barcode. Deskew can be applied locally, this has the advantage that local defects can be compensated and we do not need a slow image rotation. C. If one or more partial barcodes is found, rotate the image by the average discontinuous edge angle found, then try again. As this step is inherently slow, it should be optional. Also, note that I propose to use the average angle, meaning that we can only compensate for a global rotation of the full image when using this method. D. Perhaps step C can be optimized by looking for consecutive scan lines having barcode zones with a similar average angle and finding the bounding rectangle of those. Clone the bounding rectangle to a partial bitmap and only rotate that. Although this method will be more complex than a full image rotation, the advantage would be that less image data is copied and transformed, so the method could be faster than C (provided it is not called for noise data too often). To configure step B, I would introduce a boolean property UseDeskew. 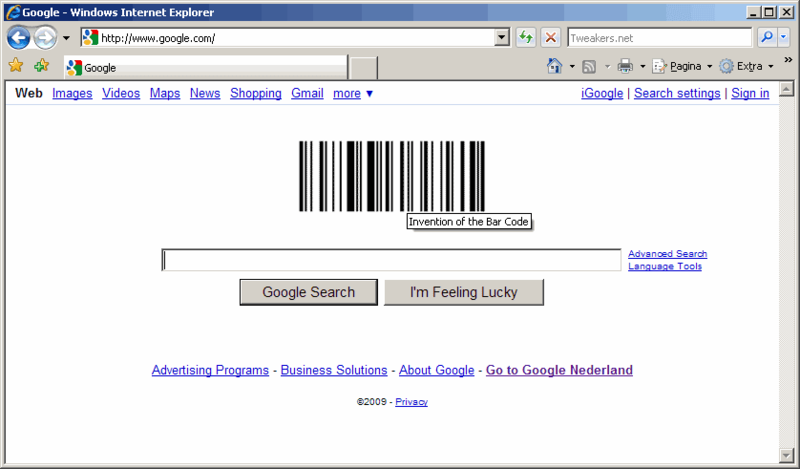 To configure step C/D, I would introduce a property DetectRotatedBarcodes of type BarcodeType. This can then be used to determine for which barcode type this algorithm must be attempted. Rotation should only be attempted if at least a partial barcode is detected, else the discontinous angle determination will be very unreliable and the software would be come far too slow. Support for rotaded, skewed low resoluted images? is it planned to support barcodes on "bad" scanned images, like rotated or scewed images? I've expiremented with originally generated Code128 (200x100 pixels) barcodes - if they rotated by more then 5-7 degrees, they would not be recognized anymore. Re: Support for rotaded, skewed low resoluted images? Unfortunately, I don't think that I can spend time on that now. I was aware of IemQi project Bamby before I started this development, but I lack the time and the mathematical knowledge to write something similar. I have considered using their stuff, but as far as I am aware it is unfortunately still fully unpublished. I have also looked at the zxing google code project, but had to reject that because the code appeared to be slower and less capable than the code project that I based my stuff on. Also the c# implementation of ZXing is fairly buggy and we did need a solution in Microsoft.Net. As to the technical possibility of improving my code in future: I believe that it is feasible to improve the code to support detection in rotated and linearly skewed barcodes. Detecting barcodes in an image of a curved surface as shown on the IemQi Blog page is too far beyond the capabilities of my code and will not be possible any time soon. Awesome project. I was just wondering if you have any plans to add support for additional image formats. Reading in the image is out of scope of the project. The barcode detection component receives a System.Drawing.Bitmap object as parameter to its public functions, that can be the in-memory representation of a wide range of image types, including multi-page tiff. In the sample application BarcodeTestApp you'll find an example of using basic GDI+ to read in the image. That application reads in gif, jpeg, bmp, png, black and white tiff and some types of color tiffs (for instance, the color tiff that infal posted yesterday can be read in). In the COM sample COMTestApp we only included very basic image support, that sample only has the purpose of demonstrating the alternate (old-style) interface to the vb.net component. Internally, the COM interface functions allow passing COM IPictureDisp and IPicture references as well as .Net Bitmap objects. Finally, in the Microsoft Word VBA sample COMTest.doc, we demonstrate our GetImageFromClipboard utility function, that works around a limitation in VBA image handling. A problem with the Microsoft.Net imaging library is the lack of support for reading in JPEG-compressed color tiff images, that many modern scanners produce. In my company we always used a third-party component to alleviate this. In the Open Source era we switched to FreeImage[^]. FreeImage is a wrapper around libtiff and various other standard imaging libraries, that can easily be used from Microsoft.Net 2.0 and higher, and even has good Visual Basic 6 support. It works fine on both 32 bits and 64 bits Windows environments and can read in many more image formats than the standard Microsoft stuff. Unfortunately, we found serious bugs in the part of FreeImage that writes multi-page tiffs. Symptoms are that tiffs appear fine in some viewers, but often white-on-black instead of black-on-white in others. My solution is to use FreeImage only for opening tiffs (this is the area where Micorsoft GDI+ often fails), and GDI+ for saving them again. great work, but not allways does a job. I've created 3 Code128a barcodes with the same barcode-creation engine in the same size. 2 of barcodes will be recognized, but 1 will be not recognized. To proove I've dome the test with DTK Barcode Reader SDK demo - this recognize all 3 barcodes. Now, I assume, that maybe check sum calculation is only broken. Unfortunatelly I don't know how to attach example file here, but I can mail it to you. I've also tried to create and recognize 300x150 barcode for the 3.rd case, but also without success. If you mail me an actual Code128 bitmap that does not work, I'll look in to it. Please also indicate what the barcode result is supposed to be, if it is not shown as readable text below the barcode. Images are sent to your mail box. I have researched the problem in your scan and found the reason why the barcode "BETA - SYSTEMS" was not recognized. It so happens that the checksum value for that text is 101 and character 101 is a Code128 control character, that is not included in the output. Because of that, the last character "S" in the output string was incorrectly used as checksum character instead of the character 101 and the Code128 checksum calculation failed. I have just upvoted you. Who downvotes a bugfix? This looks really neat! I haven't had the need for such an application yet, but I am working a bit with barcodes and may need it in the future.